Lindsay Hamilton is currently working on a project called Sports Heritage Scotland which helps to support the health and well being of people living with dementia and people who may otherwise be experiencing loneliness, isolation or depression. This work involves creating a digital archive of sports images that are shared throughout the projects memory groups across Scotland in order to trigger memory recall. People who use the groups initially, and typically, lack confidence. They barely engage in conversation, but the minute you show them their favourite childhood sporting heroes the faces light up, the discussion is in full flow and the banter is second to none. I've previously likened the reminiscence sessions to the camaraderie of the school playground. This kind of social interaction allows people living with a mental illness to feel empowered and confident. Alongside this work, Lindsay also plays for United Glasgow Football Club (UGFC) . UGFC was founded in 2011 with two guiding principles, anti-discrimination and financial inclusion. She is proud to be part of an organisation that strives to create opportunities and tackle exclusion. 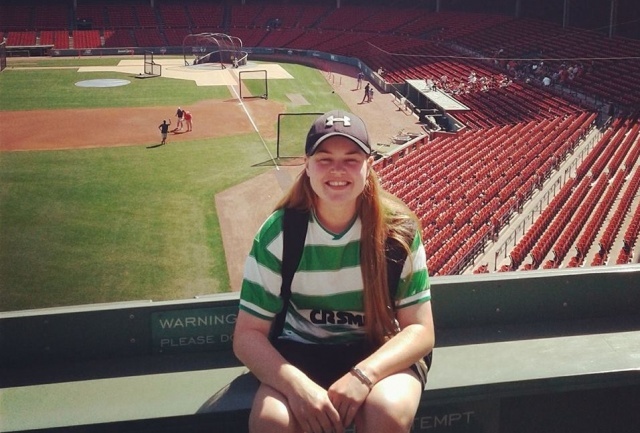 Her work in football does not stop there as she is now one of the founding members of Proud Huddle C.S.C , Celtic Football Clubs first LGBTI fan club. Lindsay believes that her passion for sport was ingrained in her from a young age, her family are all equally passionate and she thinks their enthusiasm passed on to her. Everyone in my house played a sport - even my Nana. I used to watch my Dad playing football most Friday nights. That's how I got into football from a young age, by watching my Father play. Mum was always a keen runner, and my brother was incredibly committed to martial arts. I suppose I caught the bug. She feels as if she has constantly had to prove her passion for sport and justify the reasons why she should be allowed to participate, simply because she is a woman. She fought to always be better, know more, attend everything - there was no opportunity to slack off in any way. Lindsay’s love for sport and passion for people, and their stories, as well as the belief that sport is a great vehicle to drive change and bring people together is what encouraged her to get more involved in inclusive sport. She wants sport to be the best version it can possibly be and for everyone to enjoy it the same way she does. Her love of football means she feels strongly that no one should be excluded from the greatest game in the world. Being one of the six founding members of Proud Huddle C.S.C was her most recent venture and has given people a voice that they never had before. 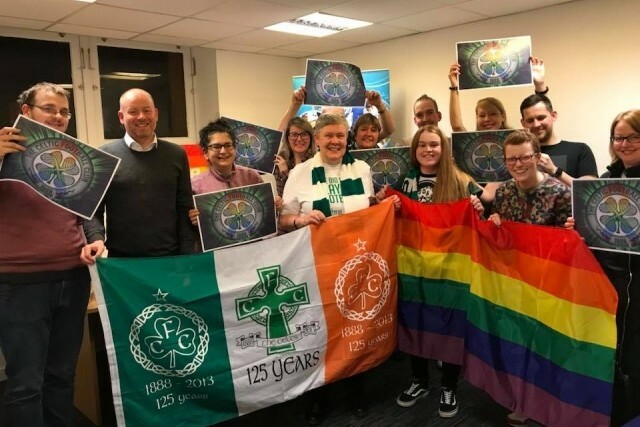 Her work with Proud huddle is not only helping to make Celtic a more fun and inclusive space for LGBTI people but is also adding to the ongoing mission to change the face of football for the better. The first time the group met to watch a Celtic game Lindsay says she expected three or four people to turn up. Instead they ended the night with sixteen people sitting round the telly watching Celtic beat Partick Thistle 2-1. She felt inspired and made her feel incredibly proud. If anything its created friendships we never imagined we would have. The first LGBT Celtic Supporters club brought together like-minded strangers; I now call these strangers my friends. I suppose that's the point of it all really. Written on 22nd February 2018.